Stock photo of the Furneaux Lodge, Endeavour Inlet, Queen Charlotte Sound, Marlborough, South Island, New Zealand. The Furneaux Lodge has a magnificent view of the tree covered mountains and the bright blue sky. 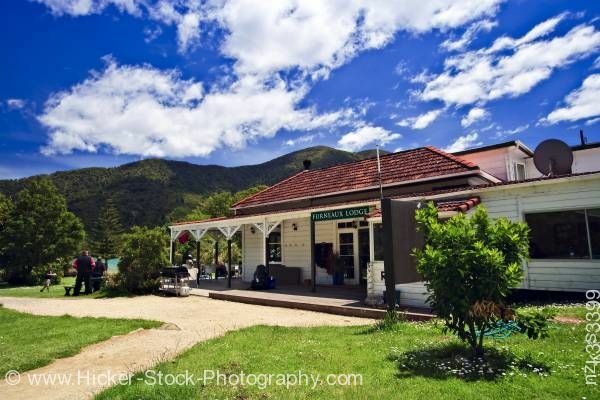 This stock photo shows the Furneaux Lodge and its amazing mountain view, Endeavour Inlet, Queen Charlotte Sound, Marlborough, South Island, New Zealand. The Furneaux Lodge has a magnificent view of the tree covered mountains. The bright blue sky with big puffy white clouds is a wonderful contrast to the beautiful mountain view. The sandy walkway leads up to the Furneaux Lodge. The front of the lodge has a covered porch supported by columns. A green sign hangs on the front of the porch leading to the door to enter the lodge. The lodge is white with a red shingled roof has a sandy walkway and a green lawn in front. A few trees sit around the lodge. To the left of the lodge, people enjoy the wonderful view while having a meal at the picnic table. Furneaux Lodge, Endeavour Inlet, Queen Charlotte Sound, Marlborough, South Island, New Zealand.